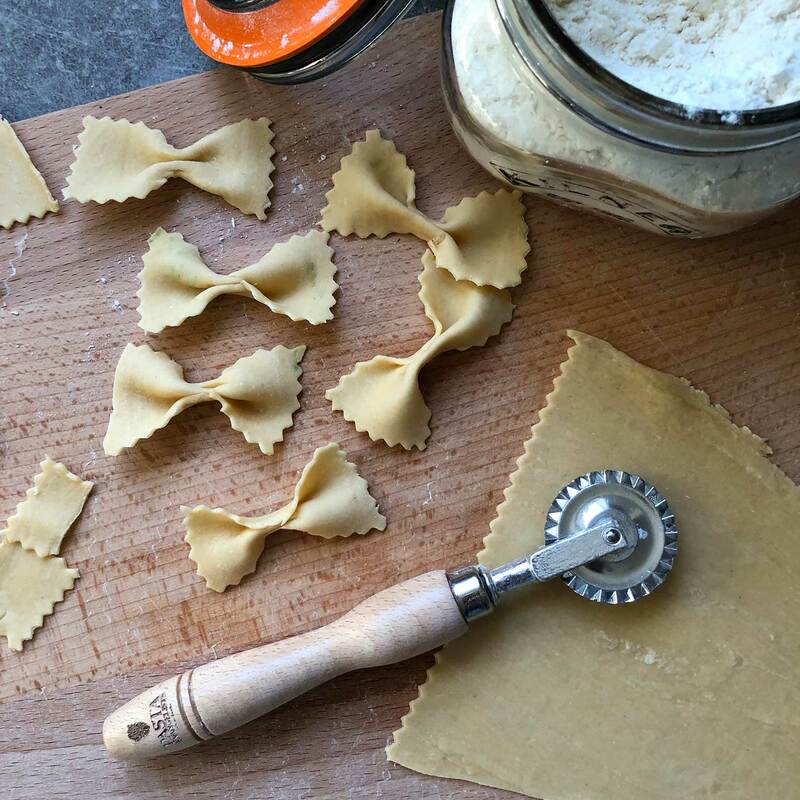 I’ve been trying out my new Pasta Making Kit sent to me from Pasta Evangelists – which I LOVE! 💛 It comes beautifully packaged along with some recipe ideas and it has all the tools to help you make different pasta shapes from scratch. 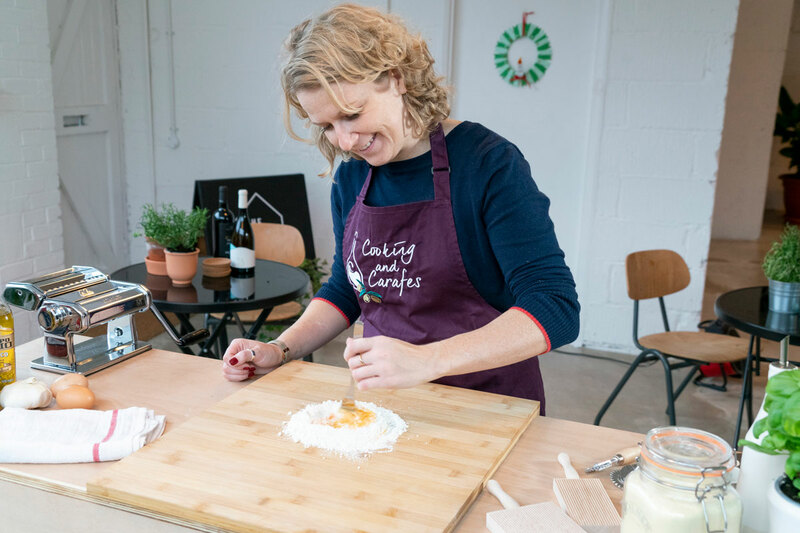 This is the kind of kit I would love as a gift, so if you’ve got a foodie in your life that you know will enjoy getting creative and trying something new in the kitchen then keep reading… ppsstt, there’s a discount code at the end! My first tip for pasta making is to have fun! I meet so many people that say “I love pasta but I’ve never tried making my own”, it’s honestly not as hard as you think. Some of the best pastas are the simplest dishes and that goes for the pasta too. You can always start with easier shapes, for example you could just start with lasagne sheets or tagliatelle and as your confidence grows get more adventurous. The ratio of 100g to each egg always works well, so you can alter as required. Make a well in the centre of the pasta. Crack the eggs into the well. Using a fork gradually mix the egg and slowly introduce the flour (try to not break the wall if using a board). It will start to form dough like clumps (I don’t know how else to explain it! ), don’t worry, this is normal. 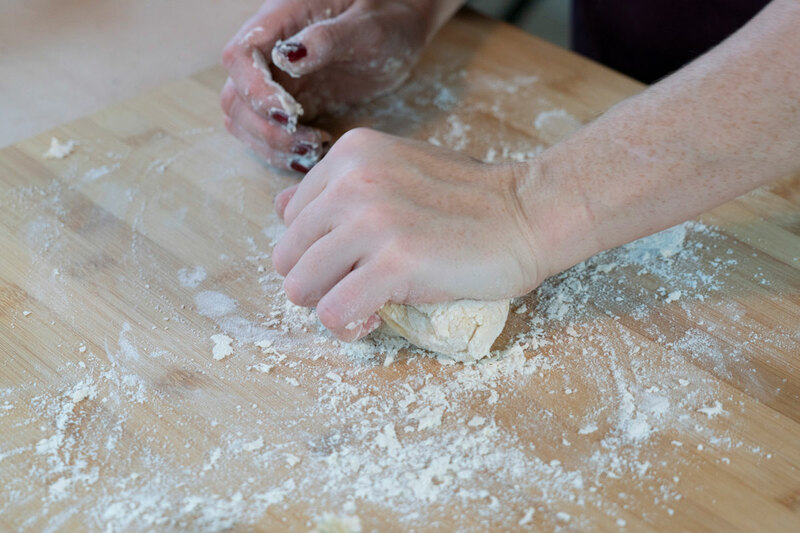 Using your hands, combine it together and begin to knead it to form a dough. Knead it for 5-10 minutes until you get a springy dough. Wrap it in cling film or a beeswax wrap and leave to rest for about 20-30 minutes. If you’re going to leave it any longer I recommend resting it in the fridge. I always used to think this was best but actually you can leave it at room temperature if it’s not for too long. Whilst your dough is resting you can be preparing the filling for your ravioli. You can use fresh spinach or I confess I sometimes use frozen, I find this helps me reduce food waste as often spinach will go to waste if left in the fridge too long. Either way, either wilt your spinach in a pan or in the microwave and then squeeze out all the excess water. To do this I get a clean thin blue dishcloth and use this to squeeze the water from the spinach, make sure it’s cooled a little before you do this so you don’t burn your hands. Mix the ricotta and spinach together in a bowl and add nutmeg and salt and pepper to taste. The nutmeg really does make all the difference to the flavour so if you have some, use it! Now your filling is ready it’s time to roll the dough. If you have a pasta machine this is by far the easiest and quickest way to roll pasta sheets but if this is your first time use the rolling pin in your kit. Halve the pasta dough to make it easier and on a well floured surface begin to roll your dough, keep rolling until you have a long, thin sheet of pasta, like a lasagne sheet, about 3mm thick and as long as you can get it. Once your pasta dough is rolled and ready cut two sheets so they’re roughly the same size in length. On one piece, start to place evenly spaced teaspoons of filling along the sheet, leave enough space for you to use the ravioli stamp around each ball. Once you’ve done that, place the other piece of dough over the top and gently push round each bit of filling pushing out any air as you go. Then use the stamp to mark the raviolis. If these don’t cut through the dough use the pasta cutter to define the shapes and edges and cut them into shape. Place on a well floured baking tray or use semolina to stop the shapes from sticking. To cook the ravioli bring a pan of water to the boil, add some salt and add the ravioli to the pan, let cook for 3-5 minutes depending on how thick your dough was, they’ll float to the top when ready. You’ve made your own fresh pasta dish from scratch! If you don’t want to cook all the ravioli at once or prepare in advance, put them in the fridge on the baking tray, or freeze them flat until they’re part frozen and put into a freezer bag to stop them sticking together. With the Raffaello Pasta Kit you can also make tagliatelle, farfalle, malloreddus, gnocchi,…the list is endless. I promise you, you won’t regret it! Can’t be bothered to make your own? Happens to the best of us, head on over to Pasta Evangelists to get fresh pasta delivered direct to your door, if you’re not sure what it’s all about check out my review on IGTV. This looks wonderful! I love fresh pasta and the spinach is a great touch! !